SUDEP Action is giving a platform to the bereaved community to share their experiences. We would like to hear from YOU, about your journey and how you have connected with the charity during the last 21 years. 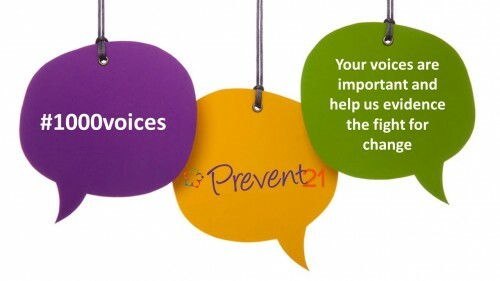 We are aiming to gather 1000 voices to help support the Prevent21 campaign. There are already over 700 voices on The Epilepsy Deaths Register, but we need more. 1000voices is a project, (that sits within the national Prevent21 campaign), which opens up the platform to the bereaved community to share their experiences. We would like to hear from our supporters about their experiences and your journey alongside SUDEP Action over the last 21 years. Your stories are important and help us evidence the fight for change. The more voices we gather, the more stories we can share – presents a wider and more accurate picture of our bereaved community and what they experience after an epilepsy-related death. Your voice is important and needs to be heard. It needs to be heard by the health professions, policy-makers, and Government, to help them understand that urgent action needs to be taken so that future lives can be saved. Every epilepsy death does count, so please add your voice and help us to be heard. How will my voice be used? We treasure all voices shared with us and will be gathering them together over time. All voices received will be gratefully received. They will be documented, and may then go on to help add weight to upcoming campaign work for SUDEP Action. Not all voices will be shared publicly, but we value every voice that is shared with us, and each voice adds to our power to create change. Firstly, we would like to take part in our survey. This survey will help us capture your journey with the charity. My Story - is an important and powerful way for you to join our campaign. We are very experienced in supporting those who wish to share their stories and who find it helpful to know that they are part of the collective ‘voice. Personal stories help to bond and encourage those that are bereaved. It’s also a wonderful way to celebrate the life of a loved one. Stories can be shared on our website, social media, newsletters and on a more global scale, via SUDEP Global Conversation. Contact shelly.johnson@sudep.org for more details on how you could be involved. The Epilepsy Deaths Register is a single point for reporting all epilepsy-related deaths. We urgently require your help to gather vital information. A death can be reported more than once and can be reported by anyone as family, friends, neighbours, and colleagues may have different information. If you have yet to add information to the register, you can do so via the link or you can call 0330 088 1220 for support. Although writing about your loved one and your experiences can be therapeutic, we also understand that it can bring up painful emotions and memories. If at any point you feel you would like to contact the support team, please email: support@sudep.org or give us a call on 01235 772852.